“Big Data will leave no sector untouched as it continues to change the way we think about everything from sales to human resources, and medicine and healthcare are no different,” writes Bernard Marr for Forbes. Prevention. Mr. Marr writes, “smartphones and other popular smart devices including Jawbone, Fitbit and others, now have the capacity to help people track their progress towards a healthier lifestyle. Apps and devices to help track and monitor physical fitness but also chronic ailments like diabetes, Parkinson’s and heart disease are also being developed.” Not only do these devices track more data but this data can be more reliable than traditional patient led tracking and reporting methods. Diagnosis. Improvements are being made to how big data is stored and shared in the healthcare industry with the goal of bringing medical providers more access. Systems, such as IBM’s Watson, are also looking at test results, recognizing patterns and learning in order to aid in diagnostics and improve early detection. Treatment. To get to more personalized medicine and better patient treatments you first have to start big, as in big data. The results of big data analytics, predictive modeling and new systems crunching vast amounts of information will help to better inform doctors about the needs of each patient. Big data is definitely a “game changer” for the healthcare industry both now and in the future. Precision medicine. Ms. Bresnick comments that precision medicine is moving from theory to everyday practice. Several initiatives are coming together currently to not only build data sources but also to put findings into the hands of practitioners. In the healthcare industry yourself? Share your thoughts on key big data transformations in 2015. Today let’s take a look at a healthcare analytics use case from IBM involving automated reporting and optimized analytics operations for athenahealth. Athenahealth provides cloud based services to doctors, providers and large hospitals across the country. As they grew their healthcare analytics solution started to fall short and analysts were finding themselves spending more time gathering the data rather than analyzing it. Business leaders also found themselves with little opportunity to get at the data themselves creating a bottle neck within the analytics team. Sound familiar? This is a common occurrence at any-sized business but given the volume of healthcare data and sources, finding a solution to automate can be a game changer to how you serve your customers. Athenahealth came to IBM looking for a solution that allowed them to provide the same level of healthcare analytics and back-end support to each of their customers, no matter the size. Not only did they want to save time but they also wanted to empower business leaders by providing self-service options. Since implementation they have gained efficiency and improved access for business leaders. Some processes have gone from days to minutes and analysts are seeing a real gain in the time they now have to analyze the data to better serve their customers. What pain points is your company facing as its data and sources of data continue to grow? We have all seen the headlines around what big data can do for the healthcare industry and patient care. Today let’s take a step back and look at what a successful architecture might look like with every day healthcare data sources in mind. Krish Krishnan breaks down data sources for IBM’s Big Data & Analytics Hub. He writes, “Big data is information that is both traditionally available (doctors’ notes, clinical trials, insurance claims data, drug information), plus new data generated from social media, forums and hosted sites (for example, WebMD) along with machine data.” He breaks down these data sources among Volume, Velocity and Variety or the three Vs of Big Data. Getting started with big data may seem daunting at first, but a trusted, experienced business partner can guide you down the path so your organization (and patients!) can soon start to realize the benefits of big data. What can Watson do for your business? We all remember Watson as a past Jeopardy contest many years ago. Fast-forward to the present and Watson has moved well beyond its game-show debut and is impacting industries all around us. The Verge writes, “Watson partnerships galore! In the last four months, the supercomputer has taken part in everything from fantasy football and natural gas operations, to diabetes prediction for people who shop at CVS pharmacies.” Watson is built to mirror the same learning process that humans have—through the power of cognition. What drives this process is a common cognitive framework that humans use to inform their decisions: observe, interpret, evaluate, and decide. “We’ve been giving Watson eyes,” The New York Times Bits blog reports as Watson recently made a key move to add image analysis and recognition into its healthcare capacities. And it’s not just healthcare, “IBM Watson to Help Cities Run Smarter” reports eweek. It is also playing a role in advancing robotics and don’t forget Chef Watson. Also relevant to many of us this time of year, “Coach Watson” (Wired) could become a key member of your fantasy football team. Want to learn more about what IBM Watson can do for your business? Join us September 17thfor our seminar Brews with IBM Watson: The Future of Technology. 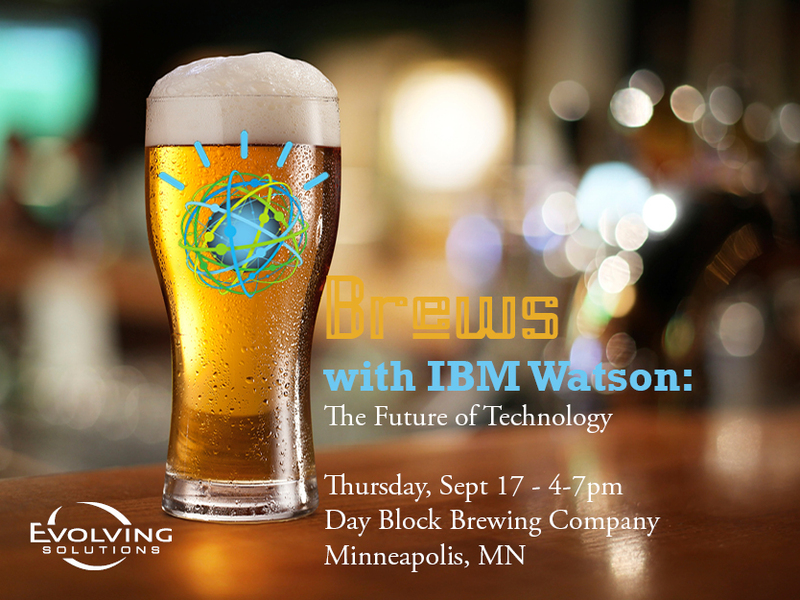 Evolving Solutions leaders and IBM will be discussing Watson at Day Block Brewing Company in Minneapolis with a special focus on the healthcare industry. Register today. To keep you on top of the latest and greatest healthcare technology news, we’ve rounded-up a list of current topics. Mark Samuels of ZDNet writes, “using the power of the cloud to improve organisational efficiencies is one thing, but the potential benefits that can come from adopting on-demand IT in medical research are truly life-changing, creating the potential for great advancements in patient care and long-term life prospects.” He cites three examples; first Virginia Tech teams who had produced data tools to help fight cancer and other diseases have now produced software that reduces the cost of a human genome sequence from $1,000, today, to possibly pennies by 2020. Ford has also teamed up with the healthcare technology community to help monitor health and wellness indicators such as blood pressure and activity levels, using cloud solutions to process the data. And, finally the American Cancer Society used cloud solutions to improve operations and expects to save $1.5 million every year from these efforts. Lance Ulanoff reports for Mashable about IBM Watson’s entrance into the healthcare technology world via Watson Health Cloud. He reports, “The goal is a recalibration of healthcare costs through always-available access to information about personal health and how it compares to health details about millions of anonymized others.” You may have seen it in the news that IBM and Apple are also partnering up to be able to couple Apple’s personalized health tracking with other data sources that can all be processed via the Watson Cloud. Mr. Ulanoff reports the majority of the data collected will be anonymized to analyze trends but they do intend to also have personalized data available for use by doctors and hospitals to improve specific patient care. It is amazing to see how what once was a Jeopardy contestant has now turned into a powerful game-changing resource. How Can Big Data Personalize Medicine? Jacqueline Prause points to three ways big data can make medicine more personalized in a recent Forbes article. First big data has allowed for breakthroughs in “population health” which breaks down risk factors based on lifestyle, economic or medical history for a defined and specific group of people, helping to define preventative treatments and practices. Second, big data has made it possible to push for physician “point-of-care” systems that help modernize healthcare systems as well as make it easier for physicians to access data for better real-time decision making. Finally, big data is playing a huge role in precision medicine by providing a structure of data to analyze to create custom treatment options. To keep you on top of the latest and greatest cloud technology news, we’ve rounded-up a list of current topics. First, check out what cloud can do for HR, then a new development with IBM’s Watson and, finally, new thinking around cloud services from Forrester. Most HR leaders have heard it before, but there can be a certain amount of “dread” when it comes to handling a specific HR system. Take those concerns and investigate how cloud technology could help. IBM recently launched its new Watson Health business unit reports Fred O’Conner for Network World. This new unit will focus on serving the healthcare community with the right tools to make health and patient data more useable and actionable. The business unit plans to utilize its cloud systems to access and analyze patient data. Healthcare data can come from many sources, such as patient records, medical devices, wearables and clinical trials just to name a few. The new Watson Health unit hopes to combine these data streams to help physician decision making. Are There 3 Flavors of Cloud? When we evaluate cloud technology should we forget about SaaS, IaaS and PaaS? Brandon Butler reports for Network World that new research from Forrester, in fact, does ask organizations to rethink the categorization of services. Forrester analysts find, “IaaS vendors are increasingly catering to application development; PaaS vendors let users control more infrastructure; and SaaS vendors allow customers to build new apps on their software.” They see cloud vendors “blurring” the lines in order to create the best public cloud platforms that meet their clients’ needs. Share how you talk about the cloud. Today let’s look at what healthcare technology trends are in the news. Finally, an increase in digital technology and data will focus attention on securing patient information and healthcare systems. Expect healthcare privacy and security to be top-of-mind and in the news this year. In Pittsburgh, a university’s health plan now uses 6.3 terabytes of data to forecast patient behavior to help provide better preventative care and to better utilize hospital resources. In Jersey City, New Jersey, the Emergency Medical Services (EMS) have been able to improve response rates to less than six minutes (average nationwide is eight minutes, 59 seconds). Their big data systems have allowed them to analyze calls with time of day and geography to better position EMS teams and vehicles. A clinic based in Virginia has worked together with IBM to examine electronic medical records to help identify patients who are at risk for heart disease. Using both structured and unstructured data, the pilot program was able to achieve 85% accuracy in detecting the medical problem. What uses of big data are you seeing in your own healthcare and community-wide?